Optimistic Man Convinces Local Teens To Clean Up Trash In Nigeria : Goats and Soda The trash was piling up in the gutter. A young man in Nigeria wanted to get local kids to help clean it up. His campaign has gone viral. Young volunteers shoveled trash out of a gutter. Sanitation workers later collected the garbage. Chris Junior Anaekwe had an idea. In his home state of Anambra in southeastern Nigeria, there was a filthy gutter full of bottles and cans and trash, all covered in black gunk. And he thought it would be a good idea to convince the local kids — local teenagers who contributed to the mess — to clean it up. But with a bit of convincing and leading by example, Anaekwe, 28, was able to gather a group of nearly a dozen boys, ages 14 to 16, to help out. On the last Saturday of January, they used shovels to dig out the trash from the ditch. The story went viral. After Anaekwe's former colleague Chimezie Anajama re-posted photos from his cleanup event on her Twitter account, the tweet has since been shared hundreds of times. Anajama, who works at a nonprofit called Policy Alert in Uyo, Nigeria, told NPR that the feeling of pride she has for Anaekwe (pictured below, wearing a red-checked kerchief), is an "understatement." 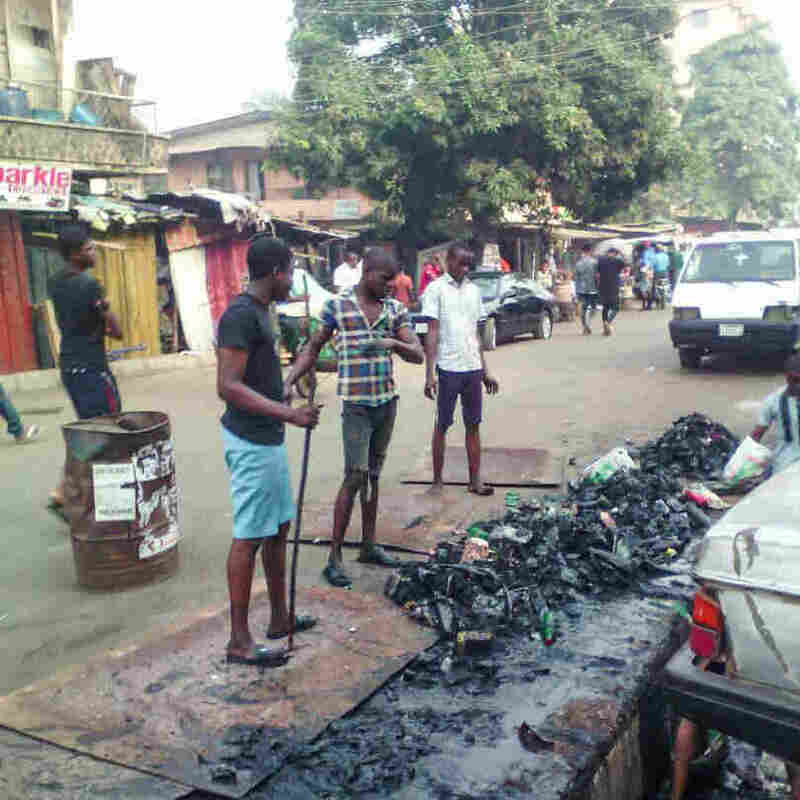 While many Nigerians on Twitter lauded him for taking matters into his own hands and inspiring youth to do the same, others pointed to it as an example of Nigeria's failure to keep the streets clean. We spoke to Anaekwe, a graduate of the University of Nigeria, Nsukka, about his clean-up efforts. What inspired you to do this cleanup? When I came back to my home state of Anambra [after living for some time in Akwa Ibom state] and saw the dirty environment around our market — one of the biggest in Nigeria — I was inspired to do something. The market has always been dirty, but the rate at which people are throwing trash now is increasing every day. It's a center of attraction. Most people pass through the street. And now it's become [a path for cars and motorbikes, adding traffic and pollution to the area]. No one is doing anything about the refuse going into the gutter. On your Facebook page, you wrote that keeping the environment clean was part of your duty as an "SDG ambassador." What is that? The SDGs are the U.N. Sustainable Development Goals, a group of targets and aid indicators [to address issues like global poverty and inequality]. I came to learn about them in 2016, when I attended a one-year program that we have here in Nigeria called the National Youth Service Course. Anyone who carries out the work of the SDGs in Nigeria, we call ourselves ambassadors. But it's not like we are officially recognized by the U.N.
During my service, I worked with the Ministry of Economic Development in Akwa Ibom state, where I worked on a community development project to [achieve one of the SDGs]. You and your team, led by Anajama who originally shared the viral tweet, chose SDG 4, which is all about education. What did you do? We did things like volunteer to provide blackboards to local schools. Your service ended in 2017, which means the cleanup event in January was not part of that program. I'm the kind of person who likes to help humanity. I'm not doing it because of what I'm going to gain. I'm doing it because this is what I want to do in life: help people around me. Why did you enlist neighborhood kids to help? They are the ones throwing trash in the gutter. They live around the area. If outsiders see the locals throw trash in the gutter, then they're going to do it, too. I wanted the kids to be the ones to clean up. I believe it will go a long way to teach them a lesson, that they are the protectors of their own environment. Did you get any pushback from the kids? It was not easy. It took me two weeks to convince the youths that we really need to do this. A good, clean environment is next to godliness, and a prerequisite for a good life. At first, many people rejected the idea. They were like no, I can't do this. Hire someone to do it. But I told them: If you want to lead, you need to be the first to do it. So I led by example. As I started to clean up, they saw I was serious and they joined me. How long did it take you guys? About four to five hours. From the photos it looks like the trash is removed from the gutter but still piled up on the sides. After the cleanup we needed to dispose of the trash so it wouldn't get back into gutter. People needed to contribute money. Luckily, some people volunteered to pay the people who [collect] the trash, and they got rid of it later that day. Did you know you're a viral sensation? Hundreds of people have seen your story on Twitter, calling you an inspiration. I'm very happy and grateful at least that someone has appreciated what I did. Some people I don't even know. It's going to push me to do this more. Some on Twitter say they are disappointed in the authorities for not keeping the area clean. We need to help ourselves. We must not wait for the government. Had you heard from the authorities about your efforts? There was no government presence after the cleanup, no one told us great job. Has anything changed after the cleanup? There's kind of like this new rule that applies to everybody living within that area. Throw your trash in the dustbin yourself. When you do that it reduces the rate of the gutter being filled up. Are you going to organize another cleanup? When I posted the photos to my Facebook I got so many messages from people inviting me to come to their street and help clean up. I promised them I will come if I have the time.